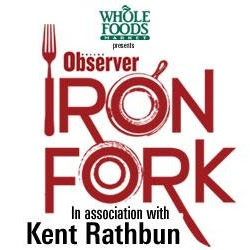 The Dallas Observer will host their 2nd annual Iron Fork event on May 8 at f.i.g. This event is a dream come true for foodies looking to sample cuisine from a wide variety of Dallas restaurants like Bread Winners, Cafe Brazil, Dallas Fish Market, Greenz, Landmark Restaurant, Lockhart Smokehouse, Primebar, Torchy's Tacos and a whole lot more! 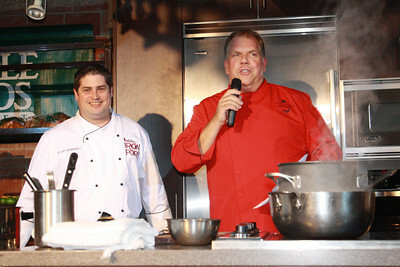 The evening's entertainment will be a Chef's Challenge moderated by local culinary legend, Kent Rathbun. Last year's Iron Fork champion, Scott Romano, is returning to battle TJ Lengnick from Whiskey Cake. Each chef will receive a basket of ingredients. The challenge is to go head-to-head in a creative cook-off using the provided items. Celebrity judges will select the winner! Throughout the night, guests will not only enjoy the Chef's Challenge, but tastings from local restaurants, live music, a mixologist station, along with beer, wine and cocktail stations. Click here to peruse photos from last year's event. Tickets are $35 for general Admission and $70 for V.I.P. buuuuuuuuuut I used my charm and good looks to persuade my sweet friends at the Dallas Observer to give my readers a little somthin' somethin'. Use the code: OHSOCYNTHIA and you will save $10 off either ticket, making your price $25/$60. You must be 21 or older to attend and proceeds will benefit the March of Dimes. I also have a pair of VIP tickets to giveaway! To enter to win, just leave a comment below and say, "Oh So Cynthia is the best blog in Dallas because ..." and leave your reason. I need your accolades and affirmation and I will bribe you to get them. :) I will pick a winner at random from all entries on Wednesday, May 2. Good luck and make me feel good starting..... now!